Are you planning to visit SF, but only have a couple of days? This two-day itinerary for San Francisco will help you squeeze in as much as possible. On your first day, I always recommend heading out to see some of SF's top attractions. This day takes you to the Golden Gate Bridge in the morning to see this amazing structure. You will get the chance to walk across the bridge, get some great views, and visit its mini-museum. Your day continues with a walk along Crissy Field. This lovely hike offers you sweeping views of the SF Bay. The path along Crissy Field ends at one of my favorite spots in SF, the Palace of Fine Arts. This free attraction will only take a few minutes to admire, but it's worth a visit. You will then head to Fisherman's Wharf to check out its museums, restaurants, and shopping. 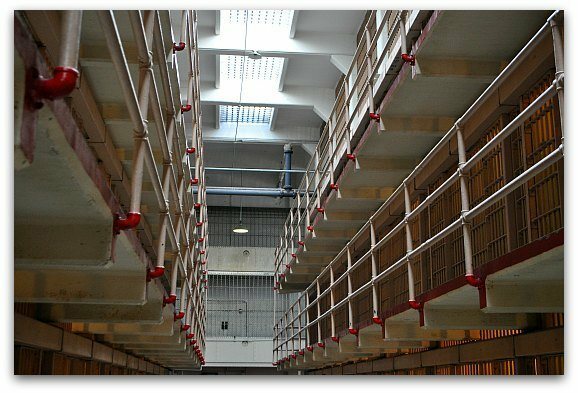 Your day continues with the night tour of Alcatraz and ends with a casual dinner in North Beach. Click here to read a more detailed view of my recommendation for your first day in San Francisco. 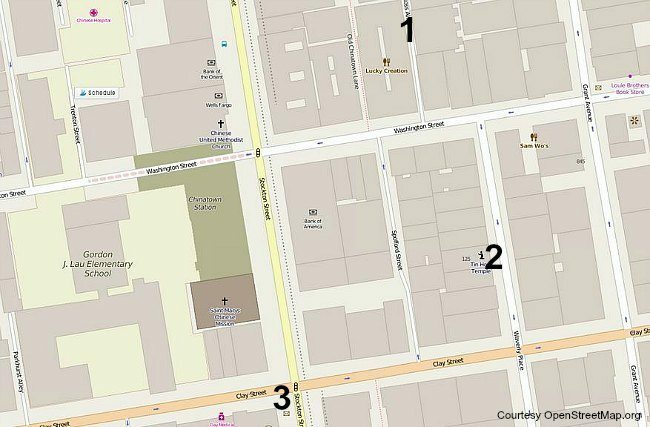 On your second day, you will explore both the North Beach and Chinatown Districts. You will start your morning with a cable car ride to the top of Lombard Street in Russian Hill. Taking the Powell/Hyde cable car is the easiest way to get here from either Fisherman's Wharf or Union Square. Once you arrive at Lombard Street, spend a little time at the top soaking in the views. You can then walk down the stairways and sidewalk to the bottom for the best view of this crooked street. It's best to visit this attraction in the morning as this is when the sun is shining on it. 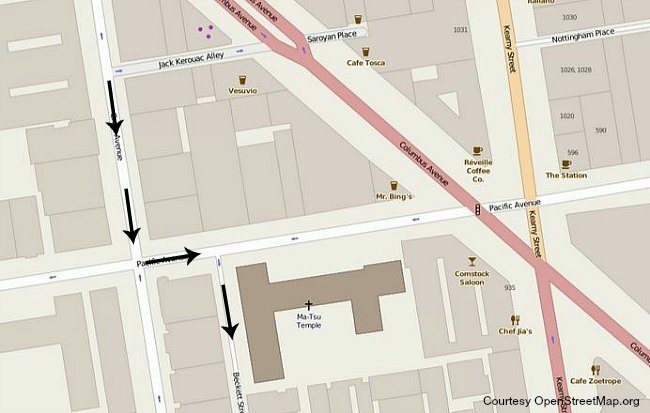 Once you are done with your visit to Lombard Street, walk toward the water (north) on Leavenworth Street to Chestnut Street. Take a right and walk a half block down hill to the San Francisco Art Institute (800 Chestnut). Step inside its main door, take a left, and follow the signs to the Diego Rivera Gallery. The gallery is free to enter. 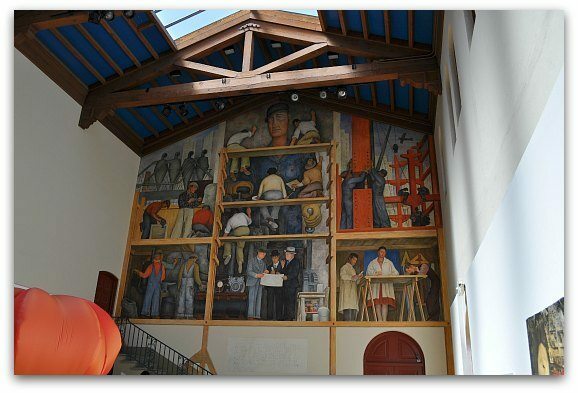 On its north wall, you will find one of Diego Rivera's frescos. It's called The Making of a Fresco Showing the Building of a City. He completed this fresco in 1931 and its one of three still open to the public in San Francisco. This small gallery often features other works from the students of the Art Institute, so spend some time looking around before heading to your next stop. This fresco is open to the public daily from 9am to 5pm. Your journey continues with either a hike or a bus ride (#39) up a steep hill to Coit Tower in Telegraph Hill. This lovely building features 1930s murals from the US Government's Public Works Art Project. Completed in 1933, these murals show the history of the area in the 1920s and early 1930s. They show everything from farmers in the fields picking grapes and oranges to a city scene with several events happening at the same time. They were highly controversial at the time as they took on topics that were not often discussed. 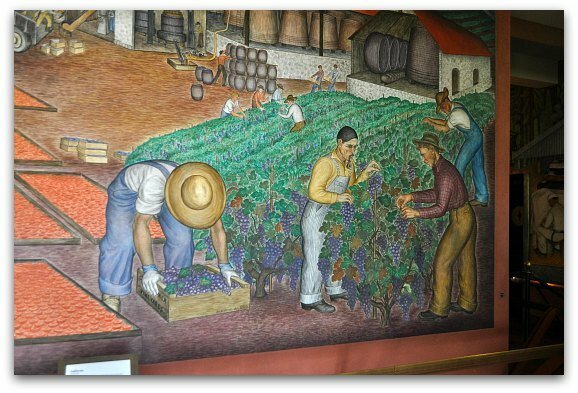 The artists also were inspired by Diego Rivera, so the murals look similar to his works (although he had NO part in their creation). Stroll around the first floor and admire the murals. Once you are done, buy your ticket to head to the top floor viewing deck. From the viewing deck, you get the chance at a 360 degree view of San Francisco. The windows are small, so you will see it in pieces, but its a great way to get a feel for the layout of this small, compact city. When you leave Coit Tower, head west down Filbert Street or take the bus to Washington Square Park. If you love focaccia bread, then you are in for a special treat. On the corner of Filbert and Stockton Streets is one of the best focaccia bakeries outside of Italy, Liguria Bakery. 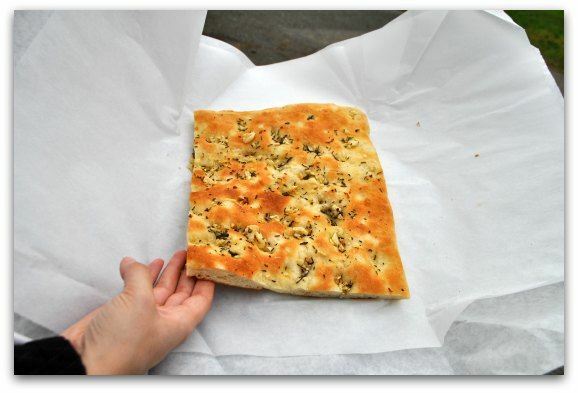 This small bakery ONLY makes focaccia bread. They make a certain amount each day and close up shop once it's sold out. My favorite is the rosemary and garlic bread. Others love the pizza, jalapeno cheese, and the plain garlic. They are $5 for a large slice, which you can share with your travel partners. You can also stop for a quick slice of pizza at Tony's Pizza Napoletana (1570 Stockton). In addition to pizza, they also offer sandwiches and salads. You can then enjoy your lunch outside in the mini-park right in front of the restaurant. Next, walk to Columbus Avenue and Broadway Streets. 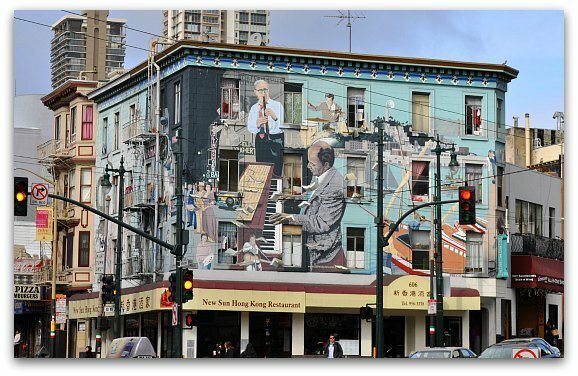 On the north western side of the street, you will see an amazing jazz mural. Continue along Columbus Avenue one block south to Jack Kerouac Alley. This is where you will find some additional colorful murals. Walk to the end of the alley and take a left. This is where you will enter Chinatown. Your first stop in Chinatown is the Ma Tsu Temple. This is a modern Buddhist and Daoist Temple that opened in 1986. Inside, you will find lovely decor, alters, and other colorful displays. It's easy to access as its on the first floor of the building. They welcome visitors and allow photography. The staff here does not speak English, so you will need to look around on your own. Remember, this is a place of worship, so please be respectful of those praying. The Ma Tsu Temple is at 30 Beckett Street. Here is the walking path from Jack Kerouac Alley to the temple. Your next stop today is at the Golden Gate Fortune Cookie Company. This small attraction is one of the only places where fortune cookies are still handmade. The owners allow you to step inside for a peek at their process. You can take a picture ($1 each). If you want, you can also buy a bag of cookies made in this factory. The Fortune Cookie Company is at 56 Ross Alley. It's about two blocks from the Ma Tsu Temple. The map below shows the walking route. The next stop of your journey is at one (or both) of the historic Chinese temples. Both are close to the Golden Gate Fortune Cookie Factory. The first option is the Kong Chow Temple. It's set in a more modern building, but was established in the mid-1800s. The original temple was destroyed by the 1906 Earthquake and Fire. The temple moved around to a few places and finally settled in its current home at 1977. Inside this temple, you will see some of the oldest Chinese relics in the United States. It's small and will only take a few minutes to wonder around. 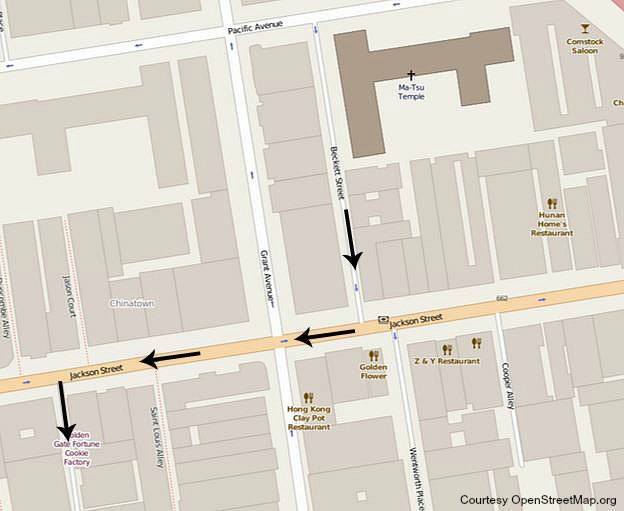 It's at 855 Stockton Street and you can take the elevator to the top floor, which is where you will find the temple. Pictures are not allowed inside. The second temple you can visit is the Tin How Temple. This is the oldest Chinese temple in Chinatown. You will also find it in its original location. It was established in the 1850s. This temple features an amazing wooden artifact that is its centerpiece. It's colorful red and gold decor make it one of the most beautiful of the three temples on today's journey. This temple is at 125 Waverly Place. The building does not have an elevator, so you must climb three flights of stairs to visit. They also do not allow photography inside the temple. Here is a map showing the location of both of these temples. The Fortune Cookie Company is #1 on the map. The Tin How Temple is #2 and the Kong Chow Temple is #3. Now that you've had a chance to visit some of the attractions in Chinatown, head over to Grant Avenue or Stockton Street for some shopping. Grant Avenue is a popular stop for tourists. It offers several blocks of shopping. This is where you will find cheap goods such as clothing, jewelry, and luggage. You will also find some great gifts for your friends and family. You will find even less expensive goodies on Stockton Street. This is where the locals shop, so you will get a small sample of what it's like to live in Chinatown. On Stockton Street, you will find several shops with goods from China. Their displays are not as well set up as those on Grant Avenue, so if you don't like to dig around for discounts, then skip this street. In addition, Stockton Street also has dozens of food vendors. I love stepping inside to take a look at the different products targeted to the locals. By this time, I'm sure you will be ready for a fun dinner. I recommend ending your day with a Dim Sum dinner in Chinatown. There are a number of great places to eat and most are very inexpensive. Dim Sum is small quantities of Chinese food. This allows you to order a large variety of items so you can sample quite a few traditional Chinese dishes. They often bring a cart around to the table, so you can pick and choose what you want to try. Are you interested in finding additional events during your stay? Click the links below to head over to each month's events calendar. Another great way to see a LOT of San Francisco is a short time is by taking the Hop on Hop Off Bus Tour. This tour offers several stops all around SF including the Golden Gate Bridge, Chinatown, and North Beach. It's a quick way to get around SF without having to find your way on public transit or by car. You can also usually purchase a two day pass at the same price as a one day pass. If you are only spending a few days in San Francisco, then the best place to stay is in Fisherman's Wharf. It's close to all of the stops included in this itinerary as well as many great places to eat and hang out at night. You will find a variety of options here from high end hotels to budget friendly beauties. The district is small, so most are within walking distance to the waterfront, the ferries to Alcatraz, the Hop On Hop Off stop, and Pier 39. Savings Tip: Before you book your hotel, make sure to check out the deals on Booking.com. It's the place to find discounts on your hotel room. Click here to head to Booking.com to check out their current special offers on hotels in SF.